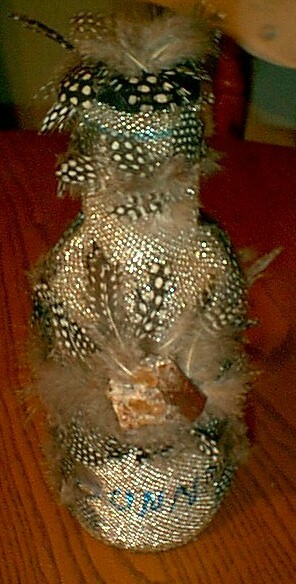 -Bev's Beaded Bottles and meet my friend Bev! I am the proudest recipient of a wonderful gift from friend and local beader in this desert......Beverly Russell. Here are some shots of her gift to me in warm thanks for teaching her some bead stitches. 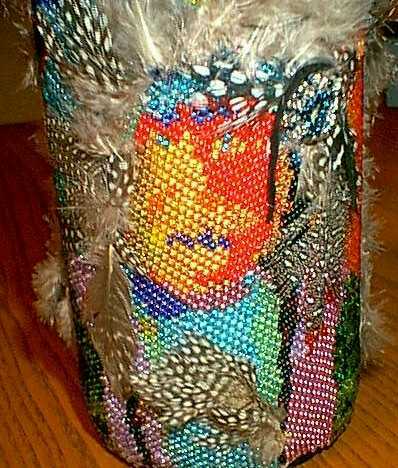 This is a wonderful Beaded Iced Tea bottle with an Indian on it and pheasant feathers. 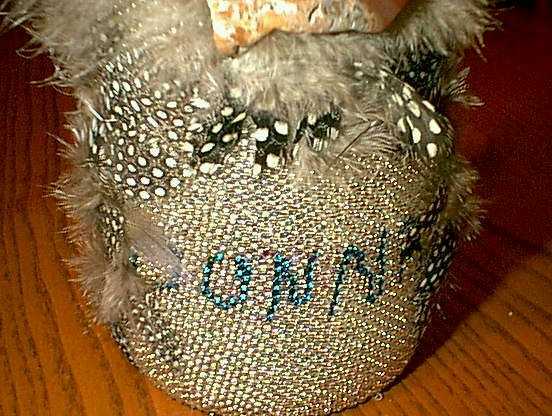 The main color of seed bead work done in peyote stitch is silver lined silver...then, there are a *bevvie* of colours in the Idian's face and Regalia. Bev attends Pow-Wows whenever she can. I will be writing a little more on Bev and her creations and future planned projects as time allows. Here is a close-up of the face with it's brilliants colours and the regalia fan below in feathers. And in my favorite colour!!!!! A shot from the back of the entire bottle. and let her know how gorgeous her work is. She can sometimes be talked into custom work for a fair price. Bev is a highly respected artist here in the desert.